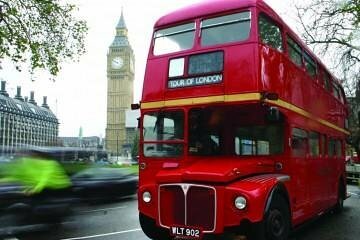 See London’s signature sights by vintage Routemaster bus and Thames River boat on this 3.5-hour sightseeing tour. Board a retro, red double-decker bus London Routemaster, and enjoy stellar views of top London attractions including the Tower of London, St Paul’s Cathedral and Westminster Abbey. Then, after a short Thames sightseeing cruise, ride your London double-decker to Buckingham Palace for a photo stop or to witness the colorful Changing of the Guard ceremony. If you wish, upgrade to add a visit to the London Eye or UNESCO-listed Stonehenge after your tour. 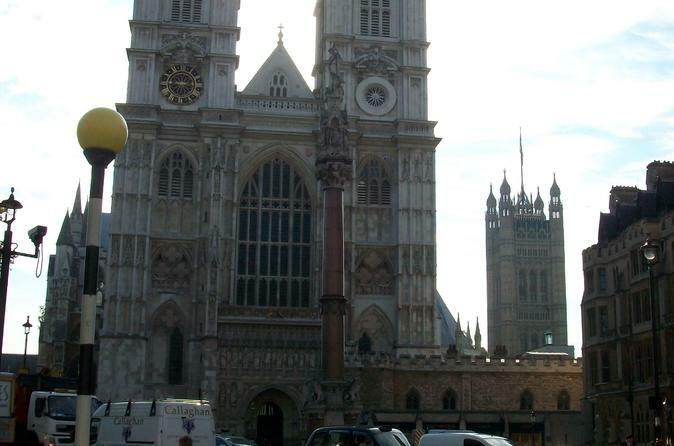 Get a feel for London and its key experiences in just a few hours on this affordable tour. Select your tour option on booking, and hop aboard your vintage, red double-decker Routemaster bus in Victoria in central London. Sit back and drink in the views of London’s famous sights as you trundle around the heart of the city. Pass top London attractions such as Big Ben, the Houses of Parliament, Westminster Abbey, and the Tower of London. Then, leave your iconic bus at the Thames River, and set off on a short sightseeing cruise. Find a comfortable spot on your cruise boat, and admire London landmarks such as Tower Bridge, Shakespeare’s Globe Theatre and the London Eye as you sail on this history-steeped river. Next, rejoin your gleaming, retro Routemaster and drive to Buckingham Palace, the official London residence of Her Majesty Queen Elizabeth II. Stop outside to see the world-famous Changing of the Guard. Watch in delight as the Queen’s Foot Guards — dressed in red tunics and bearskin helmets — exchange duties with the new guard in time to military music. If the guard change is not taking place, simply stop for photos of Buckingham Palace. After around 3.5 hours, your trip concludes with a drop-off back in Victoria. If you wish, upgrade to take a flight on the London Eye following your 3.5-hour sightseeing trip. After Buckingham Palace, enjoy a drop-off at the Eye and use your prebooked ticket for fast, hassle-free entry. Board your shared glass capsule and marvel at the 360-degree views of London as the Eye makes a single, approximately 30-minute rotation. Either before or afterward, enjoy an included visit to the London Eye 4D Experience, an incredible journey through London brought alive by multi-sensory effects and other virtual perspectives. Your London Eye trip ends when you either leave your capsule or the 4D Experience, whichever you do last. Why not take an afternoon trip to ancient, UNESCO-listed Stonehenge after your morning sightseeing tour? After Buckingham Palace, enjoy a drop-off at Victoria and board a comfortable, round-trip shuttle bus bound for Stonehenge. Then, travel straight to this prehistoric stone circle on Salisbury Plain, and use your prebooked entrance ticket to enjoy a self-guided audio tour of the monument's perimeter and impressive visitor center. Your 5-hour Stonehenge round trip then ends with a drop-off at Victoria. Please note: at time of booking you will need to select between the morning or afternoon departures. Our guide Gavin was great. A great way to see London if you don't have a lot of time. Would recommend the London eye upgrade if you have kids. We took the afternoon tour with the London eye option. We had landed early morning and wanted to get a feel of the city. We had a spare day next day to explore some of these attractions in details on our own . This tour very much satisified that purpose. Got a great feel of all the attractions and where they are . Got good tips from the tour guide. The stop of tower of london and then the cruise to London eye was awesome. Next day we visited St Pauls Cathedral for 2-3 of hours in morning and the Tower of London for 3 hours in afternoon . This tour laid the foundation for the next day because we knew what to do , when do to do and how to do trust me there is a lot to do in london and if you have limited time then you have to pick the top attractions of your interest. A worthwhile tour when you don't have a lot of time to explore and want to see as much as possible. We went in early March and the open top bus was chilly so rug up. Gave us a bus with no heat. Then didn’t tell us we weren’t coming back to the bus (it was a last minute decision because they went back to the yard to get a bus with heat for another tour instead). Tour guide made us miss the changing of the guard. Find another trip to go on! Our guide was lovely, gave us a TON of information. We went on a Sunday morning, which was PERFECT. We took the Stonehenge option, so we got to see just about everything in a very short period of time. Perfect for us, as we were only in town for a few days! Fabulos two day trip. We loved the country side, small towns and villages. A must do. Our host was good but really fast walking. Did not see changing of the guards. Do you not know what days they perform at the palace? The river cruise was great.